The date of originating of this slot Hot Sync is February 3, 2017. The number of reels is standard: five. Due to three horizontal lines, the number of paylines in only 20. There is a possibility to play in this gambling slot on any platform, including PC and mobile phone. The bets are standard either: starting from 0.20 Euros to 100 Euros. The theme is standard too: all known items to every gambler of the world, like: double cherries, watermelons, plums, lemons, ‘7’, diamonds, bells, stars, wilds, scatters. The red circle is a scatter. It has an inscription ‘BONUS game’ and three of them are enough to start a bonus game. There are two wilds: normal one with ‘wild’ inscription and HOT SYNC Wild. The first one substitutes all but HOT SYNC Wild and scatter, while HOT SYNC Wild substitutes every item, including scatter. HOT SYNC Wild does not give out the payment, but the normal wild gives 50 times the bet you’ve done if you see them 5 in a row. Two HOT SYNC Wilds trigger respin. The mode of respinning becomes hot as they make the reels, on which they have occurred, hot means that a gambler will have improved chances of becoming victorious, as on this, you will see more winning combinations. When you have at least three scatters in 2-3-4 reels, you will get into the bonus spins, thus receiving eight free spins. 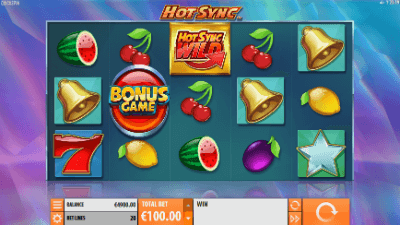 If you will be lucky enough to see as HOT SYNC Wild lands on any reel during free spins series, this reel starts to be ‘hot’ and stays it until the free rotations sequence is over. The Return to Player rate is 96.29%, which is not very high but a lot of possibilities to start a sequence of victorious events may cause you beneficial winnings.